Regular readers - assuming I have such a thing? - will know I have certain addictions, mostly based around handheld pork products. The king of these - and the best thing about the "proper" food revival that's been going on in pubs across the capital of late - is the "reclaiming" of the Scotch Egg. Whatever the origins (and I like the Fortnum & Mason story about wrapping an egg in haggis for a wealthy client to eat on long coach journeys), the Scotch Egg is, like all the good "proper" food, a snack for the worker, a joyous little bundle of protein wrapped in a crispy golden shell. There are, of course, some terrible examples out there - we're looking at you, service stations. And you, Tesco - but, happily, several places have elevated matters considerably. I should perhaps also point out that I'm a purist when it comes to Scotch Eggs. While I can appreciate the exemplary production of the Harwood Arms' venison Scotch Egg, and will cheerfully acknowledge its excellent texture, substance and lack of grease, I have to say it just wasn't as good as a pork one. The use of venison sounds good, and no doubt gets Fulhamites all excited, but it adds nothing, nada, zip. Indeed, if I hadn't known it was venison, I wouldn't have been able to identify the meat at all, which sort of puts this otherwise great snack on a par with something you find in petrol station chiller cabinets. 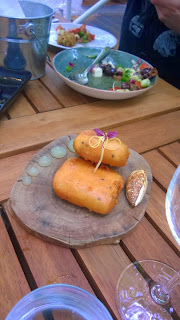 And, before you blame my taste buds, in my defence my two dining companions felt the same way. And before you blame their tastebuds, one of them's a trained chef and very fine food writer, and the other was a restaurateur who's done more for quality British ingredients in London than just about anyone I can think of. But I digress. Pork, in any of its forms, is where it's at for the Scotch Egg. Give me a good coarse pork mince, shreds of ham hock, chunks of black pudding or, indeed, ground wild boar (currently available at Roast and definitely worth a detour next time you're Borough Market-ing) and there's a chemistry with the eggy centre and crispy outside that just makes me happy. I was rather excited, therefore, to get the opportunity to make Scotch Eggs with Henry Herbert, the (annoyingly) young chef at The Coach & Horses, and a lovely group of people I rustled up via Qype. After a little chat about the origins of the product - and a possibly-too-late wish from Henry that the Scotch Egg doesn't become his signature dish - Henry ran us through the basics. The egg is boiled for seven minutes, so that the white cooks but the yolk remains runny. These can then be peeled - carefully - to form the warm, lovely, slightly molten centre of the best examples. He then makes his own pork mince, a combination of the shoulder and the belly, to give flavour and fat content, and to that adds mace, lots of salt and pepper - generous seasoning is, he reckons, the difference between the professional chef and the keen amateur wondering why their creations don't taste as good as restaurant food - English mustard, sage, a pinch of cayenne and some shallots that have been cooked gently in butter. Then comes the fun bit. Take a lump of the meat mix (approx 50g) and slap it down on a big piece of clingfilm. 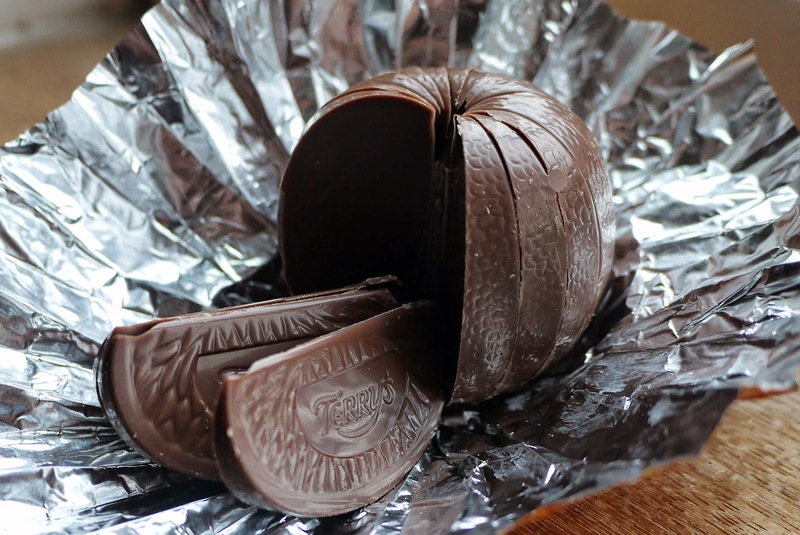 Flatten it down into a rough circle and place the egg on top. Then, using the clingfilm, mould the meat around the egg, until you've formed a perfectly sealed ovoid. This is then rolled in flour, dipped into a mix of egg and milk and rolled in very fine - almost sawdust texture - breadcrumbs. This gleefully sticky ball of goodness is then dipped again in the egg and milk, and then rolled in panko, so you end up with something that looks a bit like this. Oh... could really do with one of these right now. After a sad chicken salad for lunch. 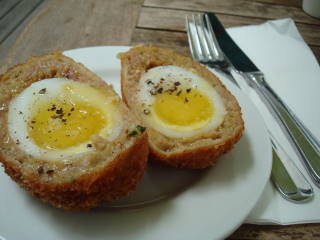 Now that is a proper scotch egg - all that runny yolk is a real treat with the sausage meat. A meal in one. Boil for seven minutes so that the white is cooked, but the yolk still runny? How long does it take you to make hard boiled eggs? Your watch needs winding up! Four minutes will leave the yolk hard. With regard to the four minute comment, we are talking duck eggs here, and the five minute eggs we used initially... well, let's just say they were a little bit messy and leave it at that. Oh oh oh, I would have LOVED to come to this! Sounds so much fun! Pete and I made quail scotch eggs recently, the first time I'd ever made scotch eggs. Didn't manage the runny yolk interiors but they were delicious! Those eggs looks very tasty indeed.